What was first: The egg or the chicken? 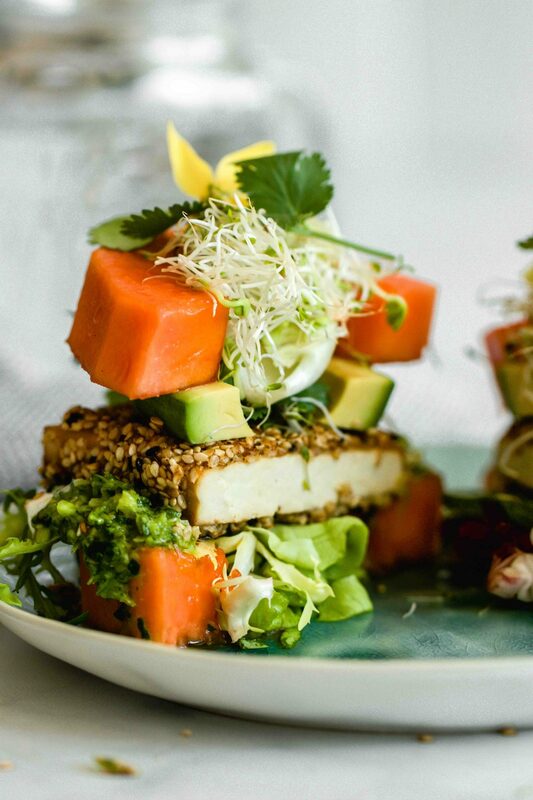 Aka what was first: The papaya burger with crispy sesame tofu or the recipe for it? I can only answer the second question: It was the burger. I start from the beginning. The time of the crime is Saturday two weeks ago. A long time ago already I wanted to try to replace burger buns with a slice of fruit or veggie to make a summer version of this classic dish. When it’s 28°C in the shade, a burger isn’t necessarily the first dish that comes to mind, unless you change a few factors. I pictured a slice of fruit, something like a watermelon or papaya, some avocado, grilled halloumi, fresh salad, lemon juice, salt, pepper and another slice of watermelon. Or papaya. In the small supermarket next door the barbecue season starts in April. This means that unfortunately there was no Halloumi in the assortment yet. The nice salesman said the oven camembert would also taste very tasty…Yaaaa…NO. Thanks, but no thanks. This didn’t fit into the fresh fruity picture I saw in my imagination. 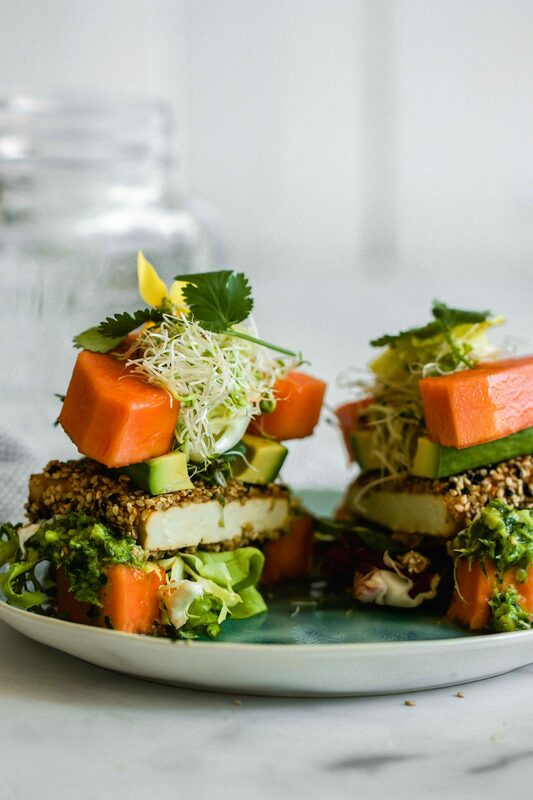 A statement from me BEFORE I bit into this papaya burger with crispy baked sesame tofu. Crispy, golden-brown fried tofu, which was previously marinated in a soy sauce maple syrup marinade, no longer has much to do with the bland tasting original from the packaging. After you have cut the tofu into slices about 8 mm thick, dab it well with a kitchen roll. The more liquid you can remove, the better. This will allow it to absorb more of the marinade later. The longer you let it steep in the soy sauce maple syrup marinade, the better. You should definitely give it at least one hour. The marinated tofu is first grilled without breading so that it can caramelize a little. YUUUM. Directly from the pan you dip it into (rice) flour, then into a (rice) flour water mixture and then into sesame seeds. 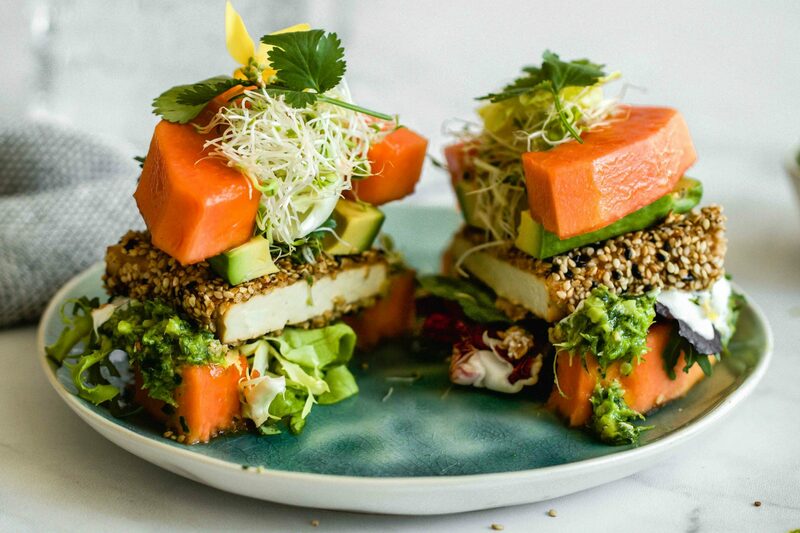 This papaya burger has great potential to become my favorite sunny weather dish of 2019. 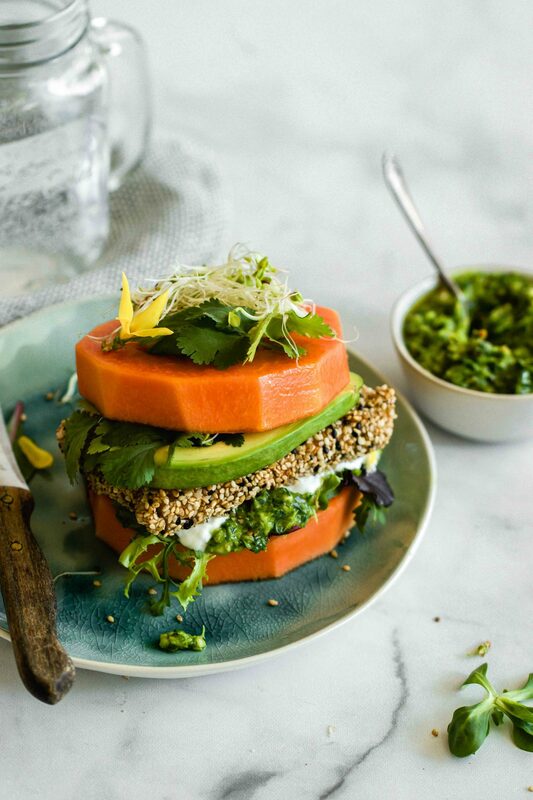 This papaya burger with crispy sesame tofu and herb pesto is a super refreshing, delicious lunch for sunny days. 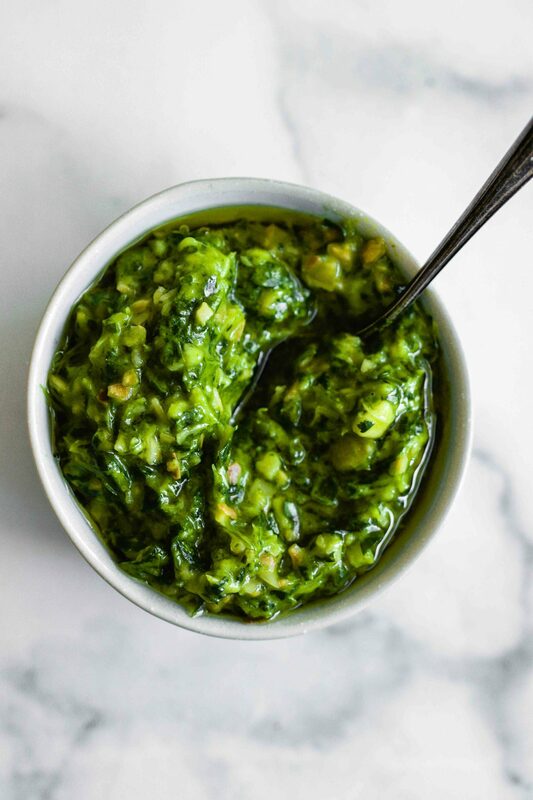 For the herb pesto, coarsely chop the parsley and cilantro and put into a blender with the remaining ingredients. Puree for a few seconds until a fine pesto is obtained. If it is too thick, add some water. Flavour with lemon juice and salt. Pour the pesto into a bowl and refrigerate. Cut the tofu into slices about 8 mm thick. Dab well with a kitchen roll. Mix soy sauce and maple syrup in a bowl. Marinate the tofu in it. Turn after 30 minutes. 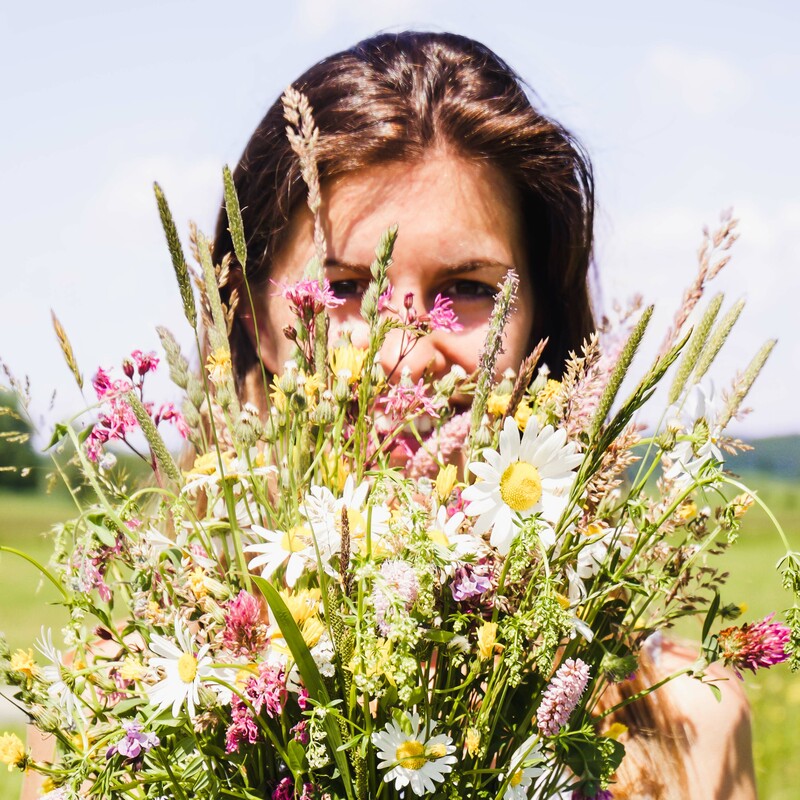 Allow to infuse for at least 1 hour or overnight. 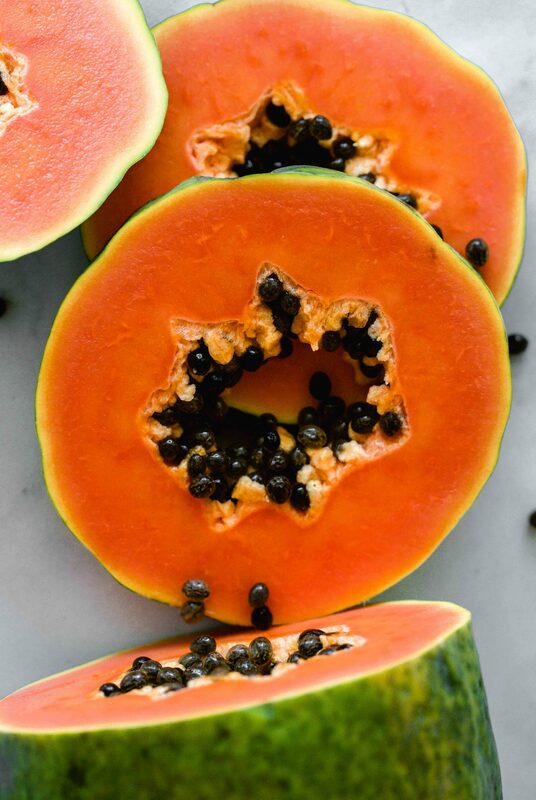 Peel the papaya, cut into slices about 1.5 cm thick and remove the seeds. Cut the avocado in half, peel, remove the stone and halve again lengthwise. Set aside. Prepare three bowls: Mix sesame, black sesame (optional), garlic powder and cayenne in a bowl. 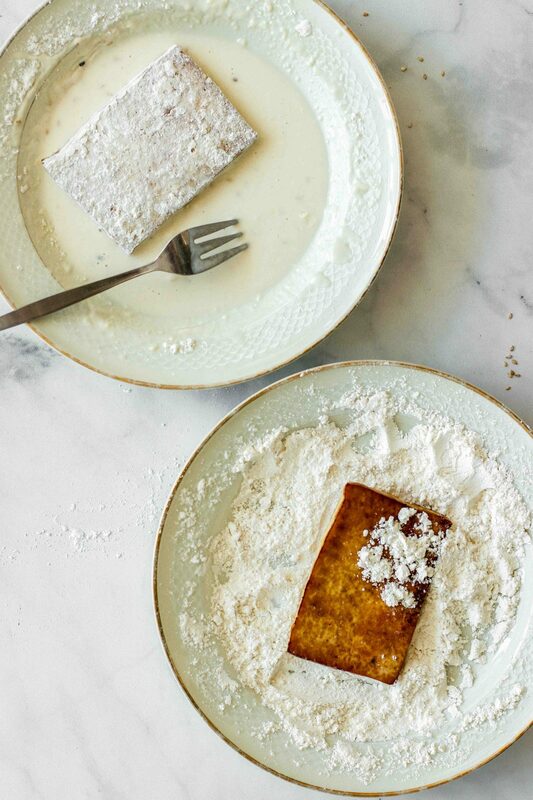 Put 2/3 cup flour in a bowl. In the third bowl mix the remaining flour with the water and the corn starch. Heat a pan with 2 tablespoons sesame oil. Fry the tofu on both sides for 1-2 minutes until it takes on some colour. Add the rest of the soy sauce marinade and grill for another minute. Put the pan aside. 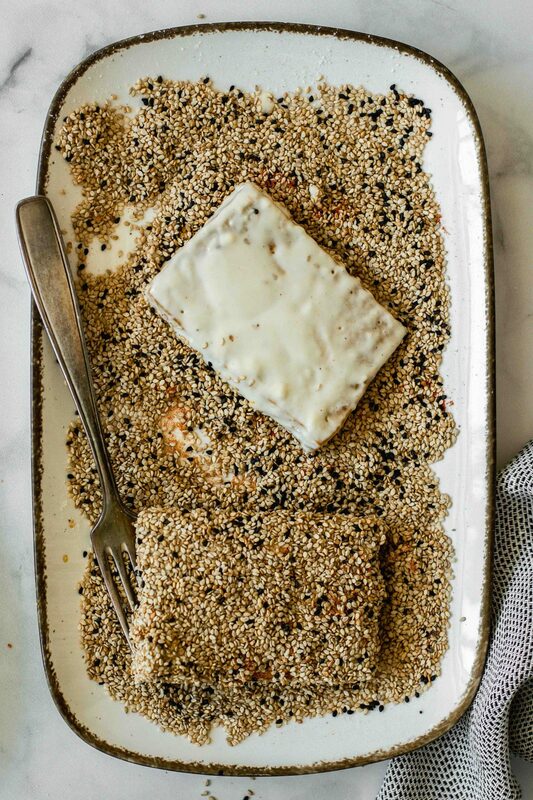 Turn the roasted tofu pieces first in the flour, then place all sides in the flour-water mixture and finally in the sesame seeds. Add the rest of the sesame oil to the pan and heat again. 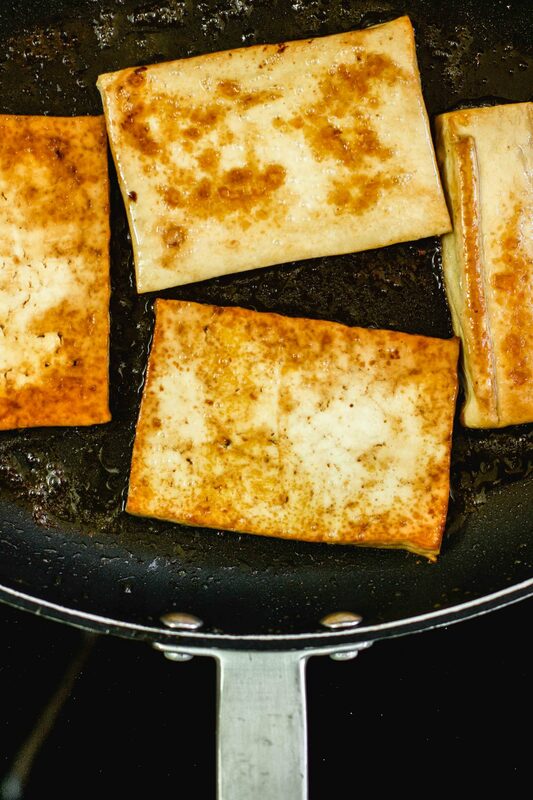 Fry the sesame tofu on both sides for about 5 minutes until it turns golden brown. Prepare four plates. Place one papaya slice on each plate. Top with fresh salad, herb pesto, 2 tbsp yoghurt each. 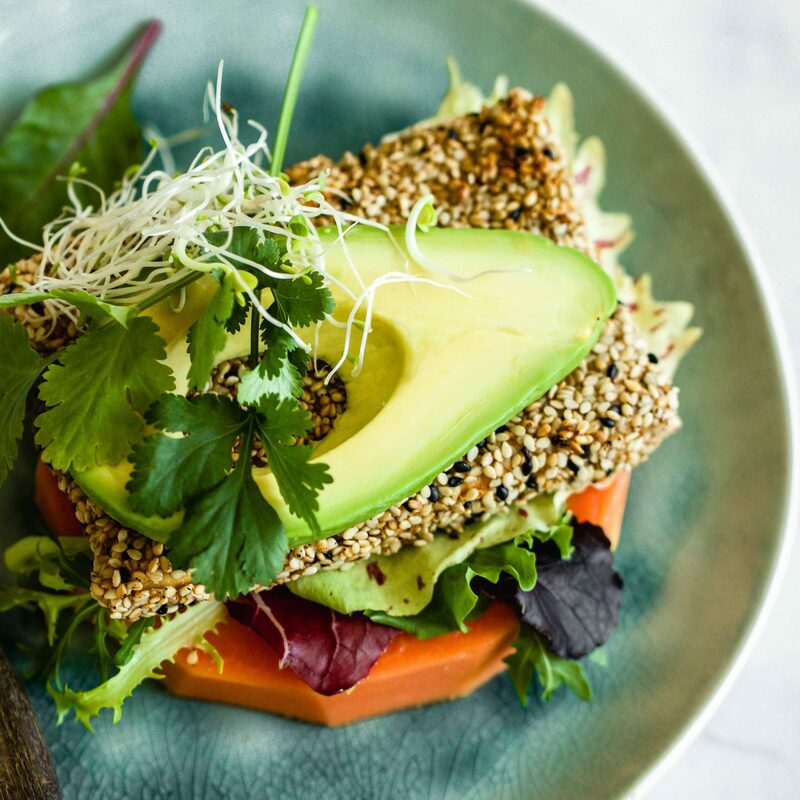 Place a slice of warm sesame tofu on top and end with a slice of avocado and papaya. Fix with a skewer or toothpick if necessary. Close the gap with the sprouts and salad. 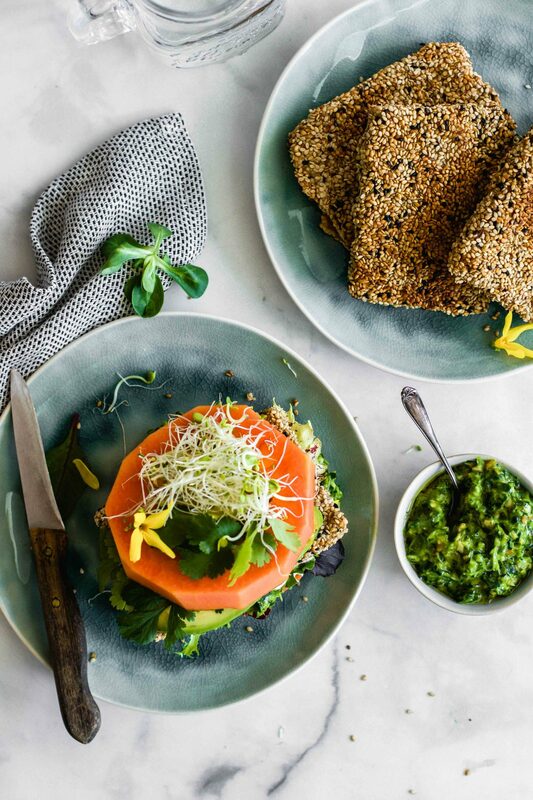 Serve with more herb pesto. Enjoy right away.